If you are looking for a decent and reliable dash camera, Thinkware F800 Pro and Blackvue DR750S are two of the most popular choices on the market right now. Both devices are flagship models from their respective manufacturers. So, which one is actually better? 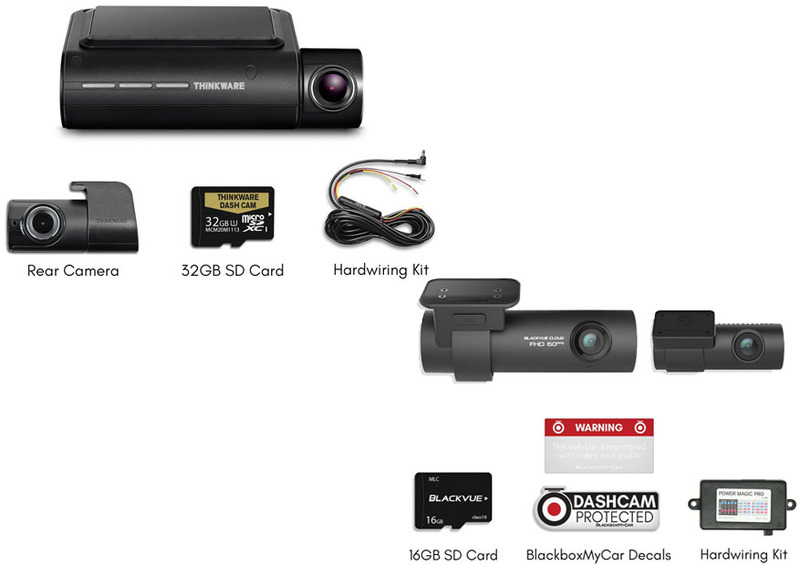 See the comparisons between Thinkware F800 Pro vs Blackvue DR750S below! – Which model that is more recommended for the money. If you put the two dash cams side by side, you can see that Thinkware F800 Pro is smaller and slimmer. It has a total length of only 4.2 inches. The narrow body and short height will allow you to stack the lens right up to the windshield. Take a look at our previous post Thinkware F800 Pro vs F800 here! Thinkware F800 Pro uses a black adhesive. The bracket is offset from the lens. If your vehicle has a dot matrix on the windshield, you can hide the bulk of the camera and make it incredibly discreet. Thinkware F800 Pro has five intuitive buttons that are labeled, so you can have a good idea about what each button performs. On the other hand, Blackvue DR750S is quite bigger. It is both longer and thicker. The offsets of the mount make this dash camera a little trickier to place. However, if your vehicle has a more upright windshield, it may be easier to place. Blackvue DR750S has two buttons, which are the Wi-Fi button and the touch sensor. The Wi-Fi button is used for turning on/off the Wi-Fi and for formatting the memory card if held down for 10 seconds. Meanwhile, the touch sensor is used for controlling the audio recording and for activating the manual recording. Thinkware F800 Pro has the ability to connect to your smartphone directly using the hotspot function. This feature is useful because it eliminates the need for a data connection when your smartphone is connected. However, this feature is a little complicated to setup. Blackvue DR750S doesn’t have such feature but is easier to setup. Through Thinkware F800 Pro’s mobile app, you can configure the cutoff voltage. The interface looks neat and organized. This model already has cloud features. On the other hand, Blackvue DR750S’s mobile app is rather unintuitive, but it arguably has better cloud features since it already has them for years. Thinkware F800 Pro’s parking mode is better because of several reasons. First, the power consumption is lower in this mode, so the recording duration can be much longer. Second, this mode is more sophisticated with separate parking motion clips and parking incidents. Third, the notifications are more detailed, including the numbers of events and motion clips detected. See the detailed specs from Thinkware here! Also, Thinkware F800 Pro’s parking mode has a timelapse mode (to conserve storage space) and a low-energy mode (to disable motion sensing and pre-buffered recording for triple recording duration). Finally, the night vision can be turned on or off as needed. Blackvue DR750S’s parking mode is significantly less sophisticated. The notifications simply tell you if something is detected, and the night vision is always on. Partitioning must be turned on manually, and it only separates parking incidents. Thinkware runs on Ambarella A12 chipset, whereas Blackvue utilizes HiSilicon chipset. In general, they have similar image quality. Blackvue has the 60 FPS setting, but the image quality doesn’t seem much better. At night, Thinkware has better image quality, with sharper and clearer objects. Blackvue has more grains. Nevertheless, it should be noted that Blackvue has better, clearer sound. - BlackVue Over the Cloud - Remote Viewing and Notifications. Between Thinkware F800 Pro vs Blackvue DR750S, we recommend you to choose Thinkware F800 Pro. It gives much better features and performance. The parking mode is much more sophisticated and convenient.